The countryside of Ireland is a patchwork of many different landscape types, including several mountainous and upland areas. 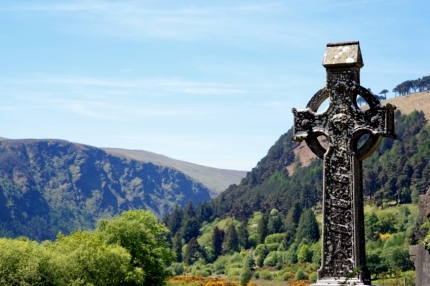 One of the most spectacular of these is in county Wicklow, just south of Dublin, which despite its proximity to the capital contains many kilometres of wonderfully unspoilt mountain trails of which The Wicklow Way is the best known. In fact the Wicklow Way was the first such trail in Ireland having been formally established in 1980. The Wicklow Way is Ireland's oldest waymarked trail, pioneered by a famous hill walker named J.B Malone, more than 40 years ago. It reveals some of Ireland’s finest views, including Powerscourt Waterfall, Luggala, Loch Dan, Glenmalure, and historical Glendalough. The trail extends from Marlay Park in Dublin to Clonegal, on the borders of Wicklow and Carlow, covering a total distance of 127 kilometers. This itinerary is broken down into a variation of different walks and distances. We plan the itinerary, book the accommodation and take care of your luggage, leaving you to simply enjoy the scenery and solitude of the Wicklow landscape.